Since today was a sort of rainy Sunday, I decided to make something new for dinner. I didn’t go crazy and experiment with something complicated like Chicken Kiev, but I hadn’t made chicken piccata before, so it’s new to me. 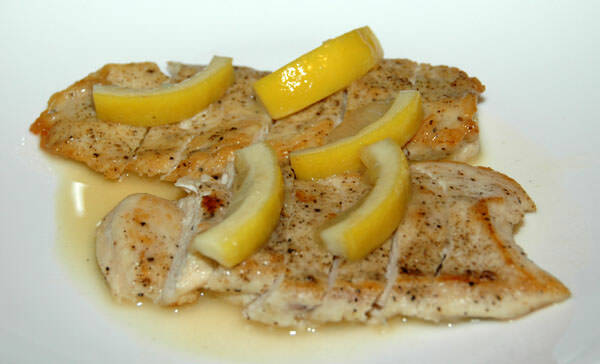 I love chicken piccata because of the light lemony flavored sauce, which is perfect for summer. 1 chicken breast cut in half. Could also have used thin sliced chicken breasts. Halve one lemon pole to pole. Trim ends from one half and cut crosswise into slices ⅛ to ¼ inch thick; set aside. Juice remaining half and whole lemon to obtain ¼ cup juice; reserve. Sprinkle both sides of chicken generously with salt, pepper, and flour. Shake to remove excess. Heat skillet over medium-high heat until hot; add oil and swirl pan to coat. Lay chicken pieces in skillet and sauté, without moving them, until lightly browned on first side, about two minutes. Turn chicken and cook until second side is lightly browned, another two minutes. Transfer chicken to plate and tent with aluminum foil. Add garlic to now-empty skillet and sauté until fragrant, about 10 seconds. Add stock and lemon slices, increase heat to high, and scrape skillet bottom of skillet to loosen fond. Simmer until liquid reduces to about ⅓ of a cup, about four minutes. Add lemon juice and simmer until sauce reduces again to ⅓ of a cup, about one minute. Remove pan from heat and swirl in butter until butter melts and thickens sauce. Spoon sauce over chicken and serve immediately.